Dealing with the loss of a pet is never easy. When dealing with euthanasia, or sudden loss due to an emergency illness or injury, the decisions that must be made and ultimate loss of the pet bring up a lot of conflicting and difficult emotions. When children are involved, special considerations must be made to help them understand what is going on and how to deal with pet loss and grief. To put it bluntly, euthanasia is "death by injection" for a terminally ill, suffering animal. Many people euphemistically refer to this as "putting an animal to sleep." The finality of death is a difficult concept, especially for children under the age of 5 or so. Children can be confused and even frightened by the term "putting to sleep" if they see the lifeless pet after the euthanasia is performed. When preparing for an appointment to have a terminally ill pet euthanized, it is best to speak in honest terms, at an appropriate level of detail for the child's age. Very small children need to know that this is final - the pet isn't going to wake up or come back. To say that the pet "went away" or is "in heaven" without offering any other details can also confuse children. Older children need to know the reasons why this decision is being made, and why it is humane for the suffering animal. To be or not to be present at the actual euthanasia is a question many adults grapple with. This is a personal decision and one that should be discussed with your veterinarian. When children are involved, some veterinarians, such as Dr. Evelyn Wilson, DVM, ABVP, do not allow children under the age of 5 to be present for the actual euthanasia. Dr. Wilson feels that the very young children have a hard enough time understanding the concept of death and that witnessing the event does not make it easier to understand or cope. She notes that even kids up to the teenage years can have a difficult time understanding the reasons why and the emotions involved with the act of euthanasia. It is important to realize that when the humans (adults and children) are upset, the pet is, too. While difficult, it is important that the humans try to lend support and comfort to their animal friend in this last time of need. Seeing their humans upset may upset the pet, too. For situations where the animal is fatally injured or is found dead from unknown causes, children need to be assured that the animal is no longer in pain. The shock can be more emotional than a "prepared for" death. If veterinary care was attempted, the child should be reminded that sometimes pets don't survive, despite best attempts to save them. Talking about the death with the child is a good first step. For more assistance and guidance, know that there are many grief and loss support resources and hotlines, many of them free of charge, available online and in the phone book. It is important never to belittle or ignore the child's relationship with the deceased pet. To say that it was "just a goldfish, and we can get a new one tomorrow" does not address the child's grief or teach the child the importance of the human-animal bond. Children often have imaginary friends that warrant conversations and emotions—pets are real —they warrant true feelings and emotions, too! It does not matter how small or "insignificant" the pet may seem to adults. Take the time needed to remember your pet with your kids and do something special to help them navigate their feelings. Having a burial, memorial, or similar ceremony helps to reinforce the importance of the pet's life and mark the death event. 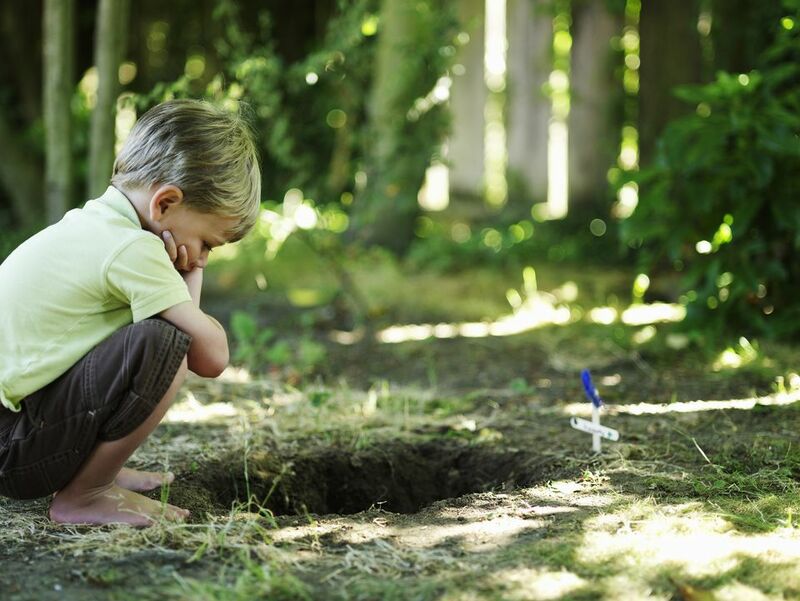 Children should be allowed to participate in whatever way is appropriate - helping mark the grave site, decorate the urn of ashes, or draw pictures of happy times together with the pet - whatever activity fits with the closure ceremony and allows the child to say goodbye in their own way. This is a very personal choice. Children should not be rushed into getting another pet to help them "get over" the deceased pet. One pet does not replace another, and getting a new pet too soon may only cause the child to resent (even mistreat) the new pet. Only once the child can speak openly about the deceased pet and shows interest in a new pet should the subject of a new pet be discussed.